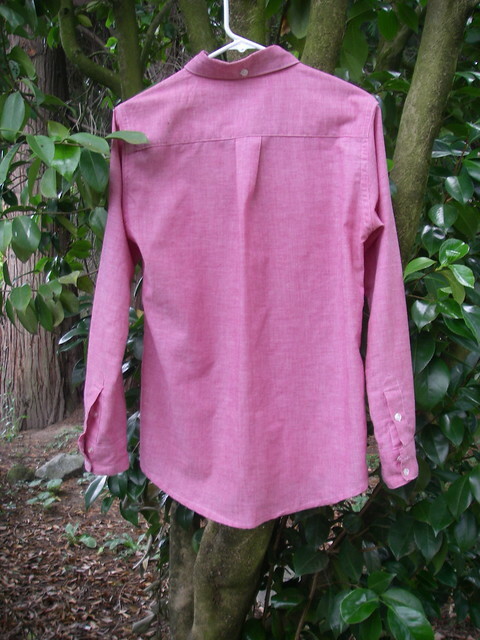 There’s something very satisfying about making menswear–well, men’s button-down shirts, anyway, as that’s the only menswear I’ve made. The fitting is easier (or maybe I’ve just been lucky), and the styles tend to be looser and not have any darts, which allows you to get right down to the actual construction, which has lots of lovely precise-but-not-too-fiddly details to work on getting perfect. 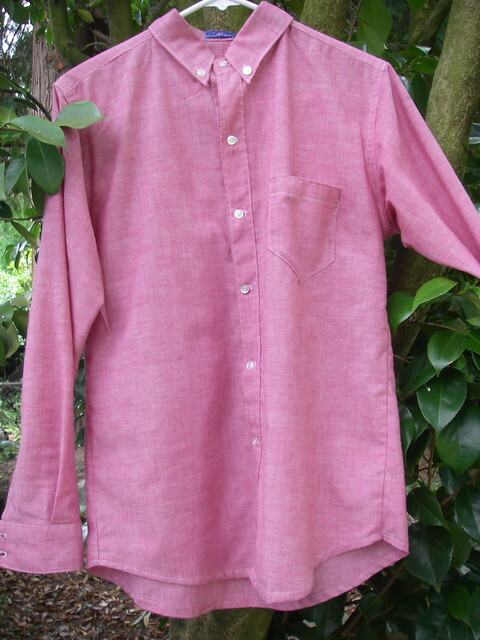 I have made Ryan (my boyfriend, for those not in the know) two shirts over the last year. 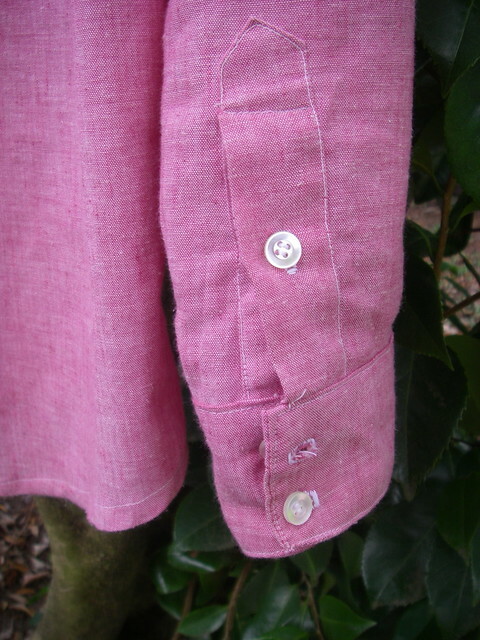 The first one was sewn up last summer out of a length of pink chambray found at a yard sale. 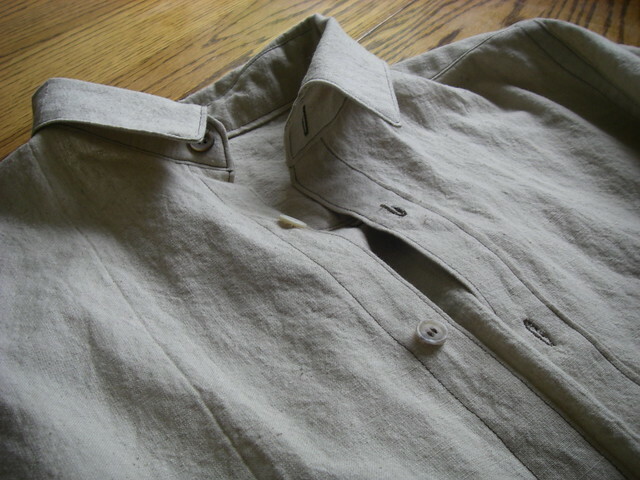 At the time he owned a nice pale blue oxford that he wore all the time, so I took a pattern off that, narrowed the body slightly, and lengthened the sleeves. 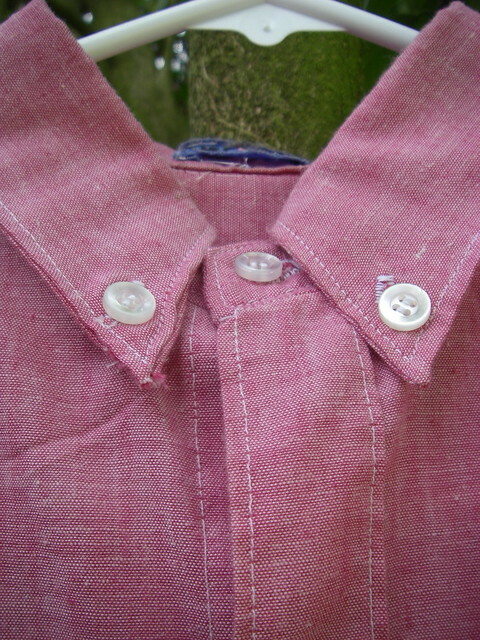 The first shirt was made pre-buttonhole-machine, so I hand-stitched every buttonhole, which is not very nice-looking if you are looking close… I also put three buttons on each cuff, one on each collar point, and one on the back of the collar, which is Way Too Many Buttons, especially when you’re doing your buttonholes by hand. There were other fiddly bits, like my first ever collar stand, which didn’t turn out too great, and I insisted on skipping the interfacing because that’s what I do. It does make a difference though, having interfaced pieces. You get a much crisper look. Overall I was really pleased with it as my first proper shirt, and Ryan’s worn it a fair bit so I’d count it as a success! Shirt number two was made this summer. 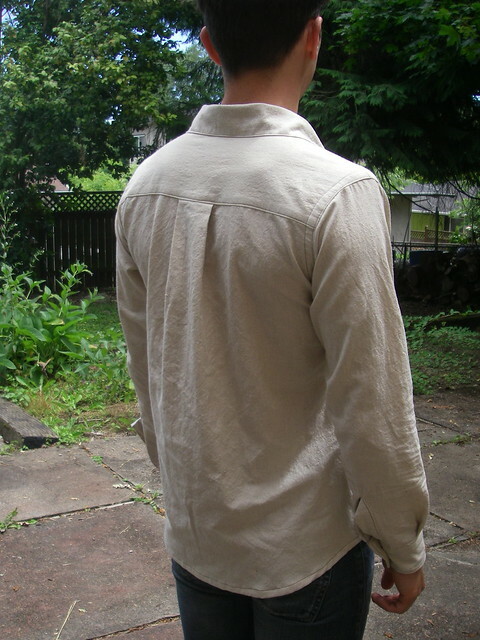 I’d been wanting to make him another shirt, but never seemed to have suitable fabric, until I dug up this lovely un-dyed linen. 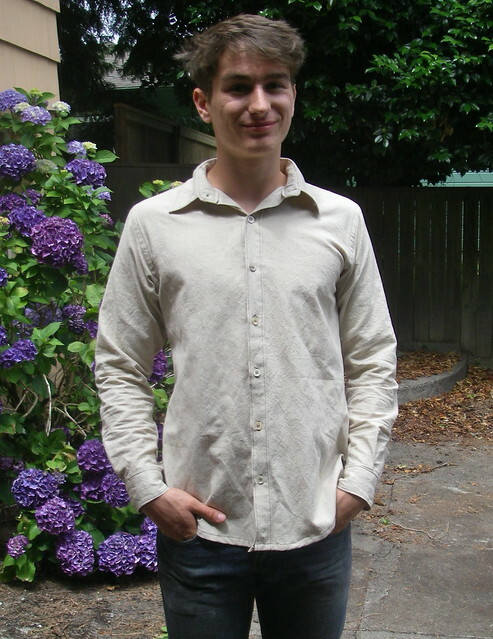 I had plans to dye half of it blue to replicate the (now lost) original blue button-up, and also to make an undyed, more casual version for Ryan’s trip to Italy to excavate a Roman villa (jealous? I am). Back to the shirt! The only alteration was to add an inch and a half to the center back and pleat it in with the rest, as Ryan has got quite a bit broader in the back over the last year due to constant parkour training, and the pink shirt was getting too tight. It was a little baffling to try and remember all my pattern-drafting logic from a year ago, such as the fact that one side of the shirt has an extra quarter inch added to the front. 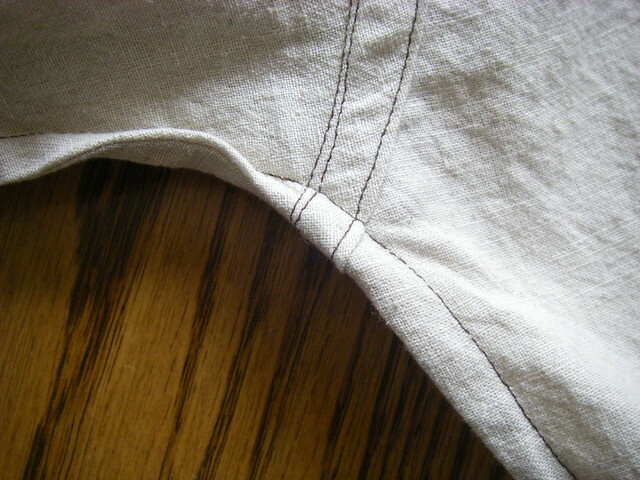 This is supposed to help with the placket, somehow, but it’s just folded a couple of times, pressed, turned, and topstitched, and there are no tucks of any sort–so I have no idea why that extra quarter-inch is helpful. I don’t even remember if I included it in this iteration, to be honest. Speaking of tucks. 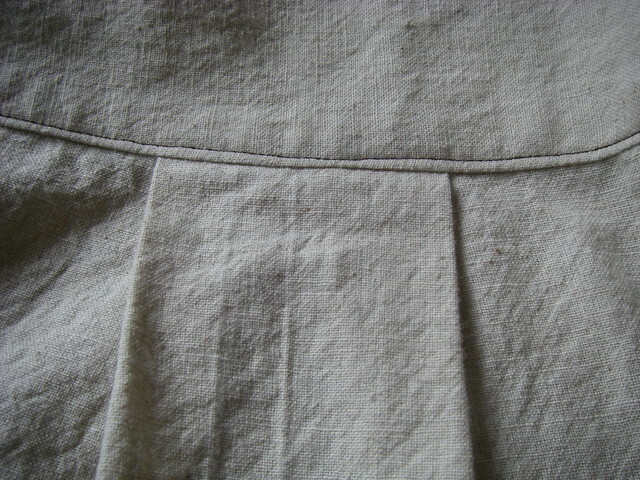 On the last shirt, something went wrong with the sleeve placket drafting and I had to make a tuck in the underside of the placket. I didn’t like it, and didn’t feel like messing with my anciently-drafted piece, so I just did a continuous loop. 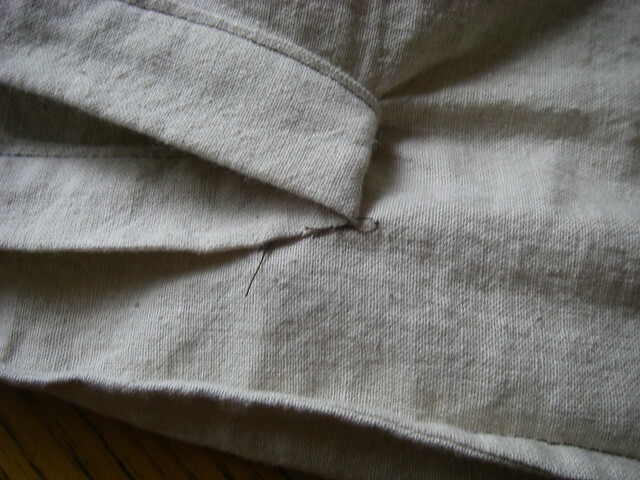 I justified it because it’s a casual shirt (I also didn’t put interfacing in the collar or cuffs), but then I had to tack it down because it was sticking out, and it puckers in places, so I am not doing that again! Other notes: The collar and collar stand were too long for the neckline, again! I have no idea why. It wasn’t a problem in the first shirt. Luckily, it’s a casual shirt (my motto, apparently), so why would anyone button it all the way up to the top? I didn’t even bother cutting open the buttonhole. I cried about the buttons. 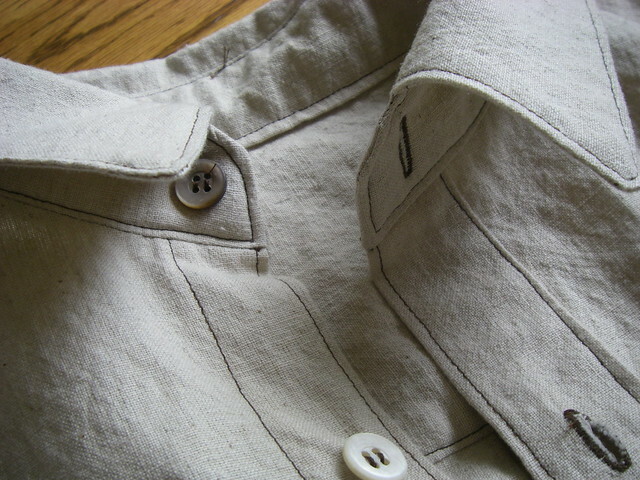 I wanted off-white or brown buttons, and the only ones I had enough of were white shirting buttons, which were way too white for the linen and the dark topstitching. I got very upset and shed real tears, much to the annoyance of everybody, and then I picked out all the best buttons and sewed them on even though they didn’t match. It doesn’t really matter, but in the future I may start buying buttons specifically for certain projects, because there is nothing like having the wrong buttons to kill your enthusiasm. 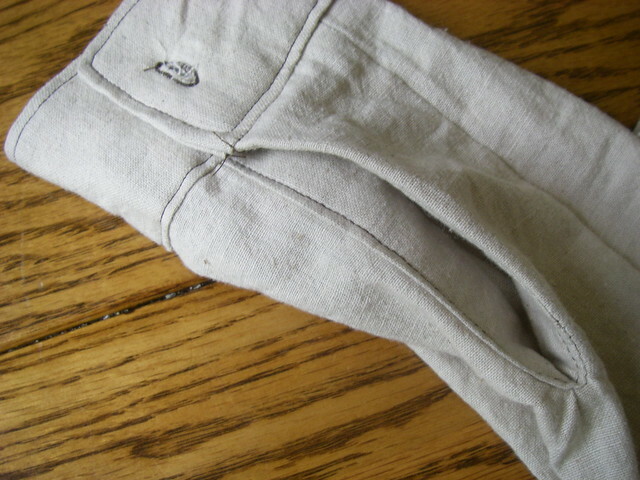 This entry was posted in sewing and tagged for ryan, menswear, sewn on August 4, 2014 by Alice.